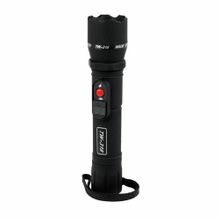 When you need to take out a flashlight, do you think having a powerful stun in your hand will make you a little more secure if you have to defend yourself against a threat? If not, no problem, it just looks like a flashlight, not threatening at all. The Covert Stun Master Stun Gun Flashlight is both a powerful led flashlight and a powerful stun gun in one. The hidden probes make it look like it is just an ordinary flashlight. If given the chance this ordinary looking flashlight will light you up and will pump 9,000,000 volts right into any attacker. It is rechargeable 2 different ways. It can be charged with the supplied wall charger and a cigarette lighter adaptor so it can be charged on the go. It comes with a standard wrist strap and has a rubberized coating to help secure a firm grip.